Hong Kong and China resident David McIntyre offers tips for photographers traveling to Beijing for the Summer Olympics. 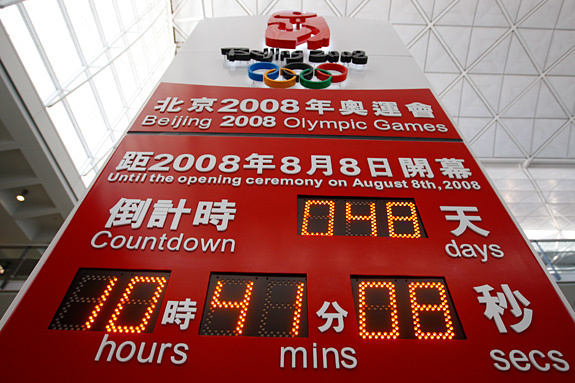 As the 2008 Beijing Summer Games are just around the corner --- August 8th, 2008 to be exact --- I thought I would take this opportunity to give some insight into what people might expect, not expect, and also feel free to ask so that I can try to answer later. As a resident of Hong Kong and China for the past 14-1/2 years, I guess I might have some knowledge in me for you all. Many people might have heard that China has made getting into China more difficult, with the lead-up to the Games. They have now required proof of return air ticket, and hotel or lodging proof in order to be considered for a visa. This used to not be the case, as it was just an interest in going to China, and you submit your passport to a local Chinese Embassy or Consulate and you got it right away. Also, if your spouse or other family is coming, they also must provide this same information for the visa. When you arrive in China, and you are not staying at a hotel (as they will do this for you when you check-in) but a house or apartment, you must register at the local area police station of that residence within 24 hours of arrival. You must also take a copy of the address in Chinese, a copy of your passport page, and visa page for them to have on record, and they will give you a slip of paper that you carry with your passport while in Beijing. Some friends of mine that were in China recently, were staying in a rented apartment for a few weeks (they had valid 6 month visa's to stay in China), and were caught with out registering by the police doing door-to-door searches for valid residence registrations. They were fined and given about 5 days to leave the country. They tried to renew their visas in Hong Kong and were refused too, so they have gone back home. Each person in your party or company must do this, as it is not a group thing. So don't really expect to just show up in China and find a cheap place to stay like when it's not the Olympics. Also is a good idea to have a copy of your passport and visa for China in case you loose it and you need to replace it. When you arrive in China at the airport, if you don't have transport arranged, stand in the taxi queue and take a taxi. Don't go with a person who offers you a ride in the arrivals lobby of the airport, as they are aiming to scam you for money. Have the address in Chinese, and if needed the phone number of someone that can tell them how to get there if they don't know. You pay by the meter, plus about a US$1.50 toll for the highway. For mobile phone service, one can get a China Mobile pre-paid phone card easily at various locations. It costs about US$ 30 to get, and you can buy recharge cards for it. You must provide your passport and visa so they can make a notation of who it is for. It is easy to use, and you can do text messaging, but you will not e able to enjoy email or GPS service on it, unless you have a regular monthly subscription. Also, a cheaper way to make IDD calls to other countries is to dial: 1795100-Country Code (USA and Canada is 1)-area code and number and then send. The country code for China is 86-and then the rest of your number. If it is a cell phone it would be: 86-and then an 11-digit number. For landline it is 86-city code (Beijing is 10 & Shanghai is 21)-and number. Also, Blackberry's and non-China mobiles should work fine in China, but be careful running up high roaming charges. Transport will be very challenging for the game. One cannot just rent a car and drive in China, as they don't recognize Int'l drivers licenses. You must have a local Chinese license. You might hire drives, but during the 2-3 weeks leading up to the games, and during them, they will be implementing odd-even days for private cars to drive in order to have cleaner air. Taxis will not be a problem, but it is better to leave early for venues if you don't have other transport, cause traffic will still be very tough, and road detours blockages will be a common aspect. Also, getting to a venue early is important, as security is going to be tighter than anything anyone has experienced before. Bring equipment into China should not be a problem, but I have heard that all equipment must be registered with your local Chinese Embassy or Consulate before you leave. (As I am a resident of China already on a journalist visa, I don't have this issue.) You will get everything x-rayed when you arrive, including your carry-on baggage. If they ask to take a look in your bags, be compliant, and smile. Have your passport and credential ready to show them if they ask. You will probably be fine without any issues, but be prepared. For getting local currency, Citibank and HSBC have many branches and ATM's arising throughout Beijing, but make sure your bank knows you are going and that you may try to withdraw from their machines. You don't want them to try and verify that you are indeed there, and not be able to reach you and then turn off your card. You can withdraw money from most cash systems with these two banks. The local Bank of China branch may not accept your cards, or some of the other Chinese banks. You can exchange cash or traveler checks in person though at the branches, but be prepared to stand in line, and pay service fees. Also good to let your credit card company know the same thing, even though many places of business in China don't accept Credit Cards yet, or only China issued ones. Cash is still the main payment form. The largest note the Chinese currency is the 100 RMB note (about US$14.50). • One World (same as American Airlines)- Cathay Pacific, Dragonair, Japan Airlines and some certain code share flights. • Sky Team (same as Continental, Delta & Northwest) - China Southern Airlines and Korean Air. For those of you that would like to go see the great wall, it is at least an hour journey by car to the wall, and if you rent a car or taxi to take you there, it will cost about US$ 70-120.00. And for those that would like to photograph the flag raising or lowering at Tiananmen Square, which happens at sunrise and sunset, so you need to be very early or wait for the sun to come down. I know I have probably missed several items, so feel free to send me an email, and I will answer any other things I may have forgotten or you would like to know. Thanks, and hope to see some of you in Beijing soon.